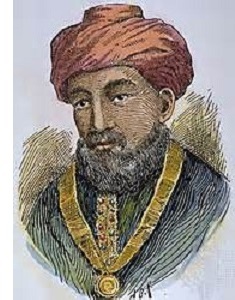 Maimonides (1135-1204) - Whereas ancient Greece produced several great philosophers, and the Middle Ages many Islamic philosophers, there is really only one towering figure in Jewish philosophy from the Medieval period. And that is Moses Maimonides. He was born in Córdoba, Spain, which was the capital of the Muslim Almoravid Empire. As a fellow Córdoban, he shared many of the same ideas as his contemporary, Averroes, and was similarly influenced by the ancient Greeks. However, the two probably never had an opportunity to meet. In 1148, while Maimonides was still quite young, the Almoravids were conquered by the much stricter Almohads. Under the Almoravids, non-Muslims were largely left alone to do as they pleased. But the Almohads required that all non-Muslims convert to Islam or be executed. The third option was exile, which Maimonides' family chose. They settled in the city of Fez, Morocco where Maimonides began his famous commentary on the Mishnah. Then in 1166 he traveled to the Holy Land before settling in Fustat (a district in Cairo) Egypt in 1168. He quickly became a leader of the Jewish community in Cairo and taught at the local synagogue (which now bears his name). While in Egypt he also finished his 14-volume work on the Mishnah, which is perhaps the most comprehensive ever written. In order to support himself he began training as a physician, and in 1183 his skill in the field brought him to the attention of Saladin himself who ruled Egypt at that time. Although, he did not work directly for Saladin, but his vizier, Al-Kadi al-Fadil. Maimonides would have been deeply involved with the political events of the time (which was the Third Crusade), and according to an Arabic historian named A-Kitti, he was asked to become Richard the Lionheart's personal physician, an offer he declined. He was considered a tireless worker, which led to his decline in health, and eventual death in 1204. Despite his work and his intellect, Maimonides is not universally accepted as the greatest Jewish thinker of his time. And this stems primarily from his love of Greek and other non-Jewish texts. Still he is without a doubt the most influential of the post-Biblical period.